There are around 300 miles of hiking trails near Anchorage. 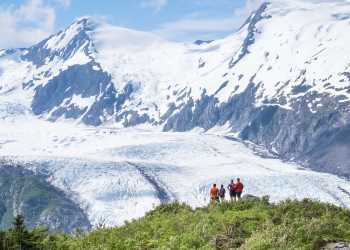 Hiking in Alaska can mean a short walk, a multiday trek, or anything in between. Which one is the best fit? Consider these Anchorage hikes as you plan your first foray. This short trail has a big payoff. The 1.4 mile trail (map point 1) is surrounded by mountains and ends at the edge of Byron Glacier. For mid-summer snowball fights, and accessible glacier viewing, it’s just one of the natural draws of the Portage Valley. Just north of Eagle River, Thunderbird Falls Trail (map point 2) is a gentle one-mile journey through rolling terrain and a birch forest that ends at a viewing platform of a 200-foot waterfall. The Glen Alps trailhead (map point 3) is just 15 miles from downtown, so it shouldn’t be a surprise that Flattop is the most popular day hike in Alaska. If a 1,200 foot climb to the summit seems too daunting, don’t worry. There’s more than one way to take in the view from Flattop. Also accessible from the Glen Alps trailhead (map point 4). Rising to more than 5,000 feet, it’s the tallest peak in Chugach skyline as seen from Anchorage. The climb’s reward is one of the finest views of the Anchorage bowl. For a shorter outing, try Little O’Malley; it’s less traveled than Flattop, and great for beginners and kids. An easy-to-moderate trail (map point 5), which begins at the end of Arctic Valley Road adjacent to the Arctic Valley ski area above Anchorage. Lined with berries in late August, it is also a favorite local picking spot. For hikers ready for a caloric burn, this 3-mile, 3,400-foot ascent begins at sea level (map point 6) and follows a mountain spine that extends well above tree line. The summit offers the ultimate view of Turnagain Arm and untouched Chugach peaks nearby. No matter which of these three trails you choose, the Eagle River Nature Center (map point 7) is the place to start. Located 40 minutes north of downtown Anchorage in the Eagle River Valley, the center serves as the gateway to the Chugach. Winner Creek Trail (map point 8) runs through the Chugach National Forest and has very little elevation gain. Out and back is about five miles through dense stands of spruce, lush fern and devil’s club. A unique hand-powered tram carries passengers across the glacial-fed, roaring waters of Winner Creek Gorge. Ascending Path runs guided hikes that show off natural aspects of the trail often overlooked by first-time visitors. Efforts pay off handsomely for the 14-mile round-trip hike to Williwaw Lakes (map point 9) in the Chugach Mountains. With emerald lakes shimmering in the shadow of Mount Williwaw, Dall sheep dotting ridgetops and wildflowers carpeting the ground, the Williwaw Lakes hike best represents Southcentral Alaska wilderness. Connecting Eagle River Nature Center (map point 10) with the town of Girdwood via a mountain pass, the 26-mile Crow Pass is a single day for fit hikers. However, many break the trek into two days with a more leisurely pace and camp in the Chugach overnight before completing the route the next day.